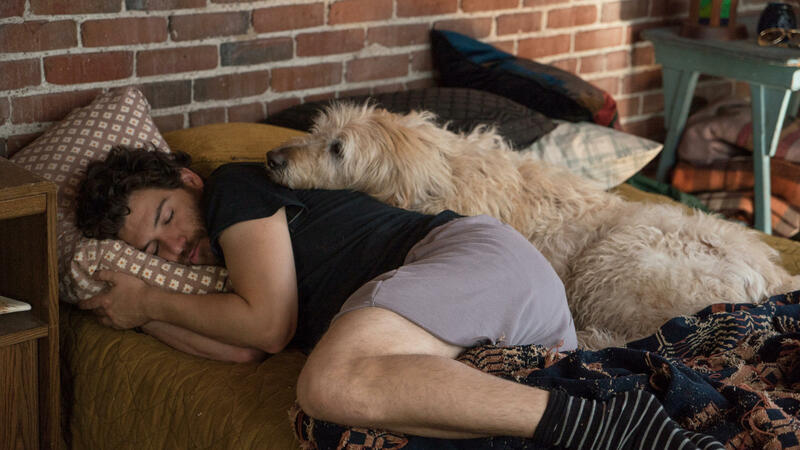 Dax (Adam Pally) and friend/comforter in Dog Days. Short Cuts meets Love, Actually ... in Dog Days, an ensemble rom-com-o-rama that brings Los Angeles dog owners together under the reasonable thesis that dogs make everyone's lives better. In fact, the film itself exhibits a dog-like sensibility: Simple, shaggy, ingratiating, lovable, and totally disinterested in aesthetics, like a St. Bernard's lick across the face. It's upsetting how much this ungainly animal gets away with, but Dog Days turns earnestness into a primary virtue, beating back the clichés and paper-thin characters that swarm the film like a cloud of fleas. Suffice to say, the title of the 2005 Diane Lane-John Cusack rom-com Must Love Dogs is a proper warning label for this one. Directed by Ken Marino, who himself has turned puppy-dog earnestness into a career of playing hilarious dopes, Dog Days benefits from a cast of old friends and called-in favors from actors of past Marino projects like The State, Childrens Hospital, Reno 911!, and Party Down. His film misses the energy and comic anarchy of those titles, but it's spackled with cameos and offhand bits of improvisation that help alleviate the graceless construction and stylistic indifference of his West Coast roundelay. Mostly, he fills the screen with cute pups and lonelyhearts, and banks on reactions shots to carry it over. That's not the worst strategy when magnificent beasts like a pug, with its inquisitive two-o'-clock head tilt, are doing the reacting. The interconnected storylines need a third-act fundraiser to finally knit together, leaving most of Dog Days to cut arrhythmically from one to the other. Nina Dobrev stars as a local morning show anchorwoman whose initial tension with her new co-host (Tone Bell), a former NFL-star-turned-Michael-Strahan-style broadcaster, is eased by their dogs' affection for each other. Vanessa Hudgens plays a barista with eyes for a handsome, narcissistic veterinarian (Michael Cassidy) who works across the street, but she strikes up a friendship with the nerdy guy (Jon Bass) who runs a struggling dog shelter. Dogs are an accidental blessing for others. Eva Longoria and Rob Corddry play new parents who have trouble bonding with their adoptive daughter until a stray pug breaks the ice. Meanwhile, the owner of that stray pug, a cranky widower (Ron Cephas Jones) in a large house, turns to a pizza boy (Finn Wolfhard) to help him find it. Adam Pally is a screw-up guitarist who readjusts his rock-star lifestyle to accommodate a rambunctious dog while his sister (Jessica St. Clair) and brother-in-law (Thomas Lennon) manage newborn twins. From the disorder of taking care of a pet comes a new sense of purpose. Whenever Dog Days lags, Marino's connections to the weird-comedy world help resuscitate it with random, minor flickers of inspiration. Tig Notaro affects an withering deadpan as highly-paid dog therapist who bilks Dobrev's neurotic out of $300 a session, David Wain turns up as a clown who briefly deconstructs certain assumptions about what clowns do, and Marino himself is very funny as a slickster who steps in as a replacement co-anchor. There's a better, more eccentric version of Dog Days that convention limits to the fringes. Yet convention does yield its own fruit eventually, when the world of the film finally converges and the dog- and human-love can be expressed without reservation. Will-they-or-won't-they romantic couplings turn to will they, excitable tail-wagging canines are reunited with their owners, and suddenly the world is a harmonious city park where the right animals are matched up forever. At that, the film contentedly curls up in a ball and falls asleep at your feet.